It's Amazing how 8 years is gone by but more amazing are the countless blessings, miraculous breakthroughs, tremendous growth, changed lives, destines, and many more that we have experienced. Truly our God is Strong, Mighty and Faithful. On 14th October 2007 at about (3pm) Divine Glory Christian Church (then known as Glory Christian Assembly) was inaugurated. The beginning we knew, we are confident that the Future will be more glorious because we know we have a father who is Himself the beginning, in between and the end all together. His word is the sure foundation, upon which we started and today we stand, testifying that He is The FAITHFUL GOD and what a theme for this year’s anniversary! One outstanding testimony we have thus far is the miracle of changed lives. 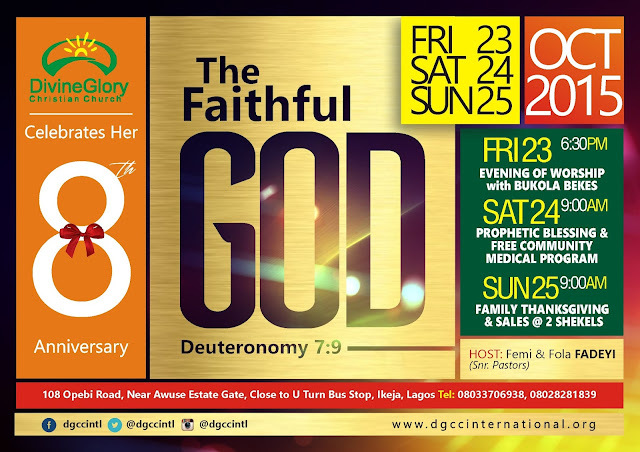 Men and women who have encountered DGCC can unequivocally testify to the Strength of the Revelation of the Word. This has been the principal instrument of the glorious transformation we have and still experience as a church and a people. We don’t see ourselves in other lights, save what and who God says we are; kings and priest destined to reign in life! God has blessed us with an incredibly emdowered Prophetic Teacher of His word in Pst. Olufemi Fadeyi-Our Senior Pastor. His deep insight into the mysteries and secrets of God can simply be termed Divine. 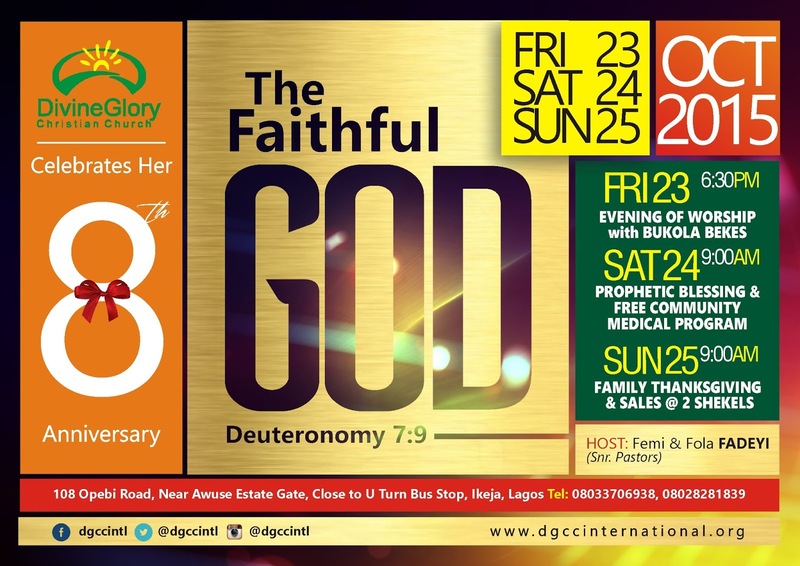 The manifestation of the Spirit in Healings, Miracles and a cutting edge Prophetic Grace accompanied by amazing testimonies are evidences of God's majestic and awesome Presence in Divine Glory Christian Church- DGCC. Remotely, you can access the church website www.dgccinternational.org for access to online messages for free and tap into testimonies to help boost your faith as well. This year, as we mark Our Church anniversary, we are led by the Spirit to reach out to people in our Community. Our church is situated at 108 Opebi Road; we have therefore mapped out an epi-center from Church location to share the Love of Christ all around us as will be reaching out to communities of Opebi, Allen, Olowu, Onigbongbo, Abule Onigbagbo, Ikeja GRA, Mende and Maryland (all in Ikeja) with a free medical service and consultation on the 24th Of October, 2015 by 10am. This include free Eye test, Dental care including minor surgery, prostrate and cervical cancer test, cut dressing e.t.c. There will also be a Spiritual Healing Clinic for men and women where hands will be laid on the sick for supernatural healing of diverse kinds of diseases. We believe that people in our community should enjoy material prosperity as well as sound health. Therefore on Sunday the 24th by 9am, we will be hosting a Programme called ''Sales @ 2 Shekels.'' This program is a ministry initiative where members of the community who turn up will be able to get home appliances, utensils, foodstuffs, clothings, gadgets, e.t.c for almost free as they will be able to buy items at ridiculously cheap amount and even some for free. It’s a mandate we have received to touch the lives of people in our community and we can but only obey. Earlier too on Friday 23rd Friday by 6:30pm at the church auditorium, we would be in one accord worshiping with Bukola Bekes, the Psalmist, & other anointed minstrels. It’s truly a season of the overflow and we desire that all around us tap into this.